On 12 January 1980, “Move Your Boogie Body” by The Bar-Kays was at #57. It peaked in 1979 at #53. OK, let’s talk about “Move Your Boogie Body” and let’s talk about funk, because “Move Your Boogie Body” is as funk as funk gets. Which is to say I hate it. Which is not to say I hate funk in general; there’s a lot of fun and interesting funk. Like “Brick House” by The Commodores; who doesn’t like “Brick House”? And there’s a lot about funk in general I like — interesting instrumentation, complicated rhythms, a general sinuosity, and lots of bass guitar. The problem with lots of funk groups, though, is that they want to sound like they’re the center of everything that’s funk, and as a result, there are a lot of bands that sound alike and, strangely, unintelligible. And that’s “Move Your Boogie Body” in a nutshell. There’s too much going on to get a sense for how this song is its own creature; it just sounds like all sorts of other funk songs. This is the disco of funk. And I can’t understand a word anyone is saying. Unintelligibility is not a problem in of itself when the voice is being used more as an instrument than in communicating information; Sigur Ros (definitely not funk) is brilliant at singing meaningless lyrics in ways that are musically intriguing. But the vocals in a lot of funk songs are jarring in a way that, while not exactly cacophonous, isn’t exactly musical either. The Bar-Keys are the kind of funk I can do without, but which was very very popular in the late 70s. It’ll take us until about 1985 before there’s going to be funk I like, I fear. 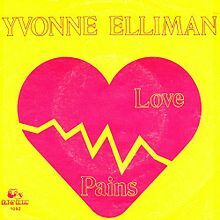 On 5 January 1980, “Love Pains” by Yvonne Elliman was at #88, its highest position in the 80s. Its peak position was #34 in 1979. “Love Pains” is our first disco song, so this is as good a place to talk about disco as any. I hate disco. I mean, there are individual disco songs I don’t mind, but as a genre, disco is really close to unbearable for me. It’s totally predictable, with its obvious 4/4, 120 beat per minute time signature, with its gleeful major chord optimism (even when the song is about horrible things or people), with its violin string section there to play accent bursts, with its kick-drum and sync-sync-syncopated rhythm. It’s music that tells you to stop thinking; unlike easy listening, it demands your attention and won’t let you think about anything else, but really doesn’t offer you much of interest to think about. It’s the five year-old constantly tugging at your pant leg, asking why why why when you’re trying to cook and/or clean and/or talk to the bank on the phone. “Oh, it’s just dance music,” you say. “Dance music doesn’t always have to be deep and meaningful.” And I agree. There’s a lot of moronic dance music out there that I like, but it’s generally dance music that at least sounds different from other dance music. To me, disco all sounds the same, and given how easy it is to assemble superdancemixes of disco tracks that all run into each other, I can only conclude that disco is designed that way. You’re supposed to dance to it and not notice that the song has changed; you just keep dancing blithely to the 4/4 kick drum. So now let’s talk briefly about “Love Pains”. It’s got the kick drum, the violins, the obvious dramatic key change for the last chorus, all the hallmarks of disco. And the lyrics! She’s singing about how she’s going to leave her lover during the night to run off with some other guy she hardly knows, but she hesitates. She’s torn. Torn between a lover or two. A lover or two? How does that make any sense? You can’t be caught between one lover, so it has to be two… unless one of them isn’t a lover, but that doesn’t fix the grammar problem, and my brain can’t tolerate it. I’d have kicked her out months ago.